Eddie came home late one evening to find me sitting in our striped burgundy and gold lounge chair, laptop in lap. I was thumbing through webpages of various cooking schools and becoming increasingly anxious. “Yea…” I muttered into the computer screen. He was right, of course. If I want to expand my abilities, it is up to me to seek the knowledge. Although culinary school may be in my future, it’s not my reality today. Today I’ll use what I have: piles of cookbooks, magazines and blogs to inspire and stretch my expertise. This is a recipe I would typically never try. Not because I don’t enjoy the food, but because I grew up cooking Mediterranean. I have a hard time layering flavors and understanding quantities of other cuisines. It’s time to start playing a game of Culinary Risk, which means following a recipe and using the written ingredients. Each week I’ll be taring pages and marking recipes that sound interesting. I am happy to report this first endeavors outcome was positive! Crunchy on the outside with a creamy interior and well balanced sauce. I don’t expect each experiment to go well, but I’m happy to report this week was a success. 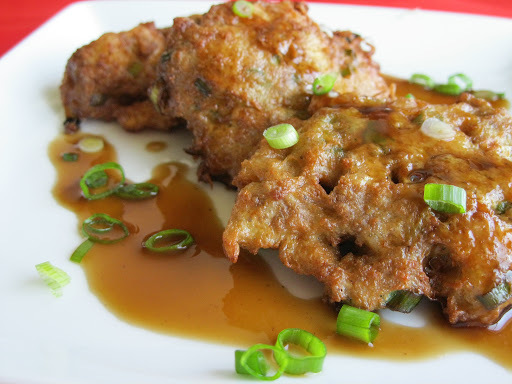 This week’s Culinary Risk: Shrimp Egg Foo Yung. This recipe is adapted from Saveur magazine and written by Mei Chin. Foodie Notes: Heat oven to 170* and transfer cooked egg foo yung from paper towels to a baking sheet in the oven. Patties stay warm and crispy while the rest of the batter is prepared. After the oil has cooled, strain the excess cooking particles and store in a container with a lid. You can freeze the oil for up to three months. 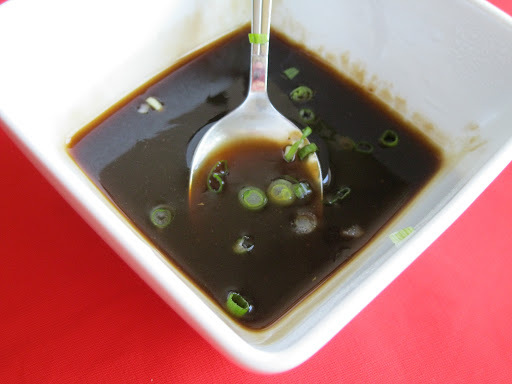 1) Bring stock, half the soy sauce, 1tablespoon cornstarch, oyster sauce, 1 tablespoon sherry, ginger and garlic to a boil in a 1-qt saucepan over high heat. Cook, whisking until thickened, 2-3 minutes; strain sauce and keep warm. 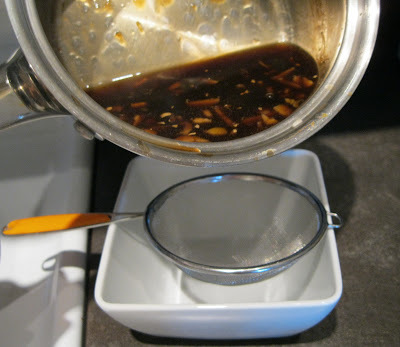 2) Mix 2 tablespoons soy sauce, 1 tablespoon cornstarch, remaining sherry, pork, 1 teaspoon sesame oil, vinegar, salt and pepper in a bowl; set aside for 10 minutes. Heat 1 tablespoon canola oil in an 8″ non-stick skillet over medium-high heat. Add pork mixture; cook stirring and breaking up meat until it is no longer pink, 3-4 minutes. Using a slotted spoon, transfer pork to a bowl; set aside. 3) Pour canola oil into a 6-qt saucepan to a depth of 2″. 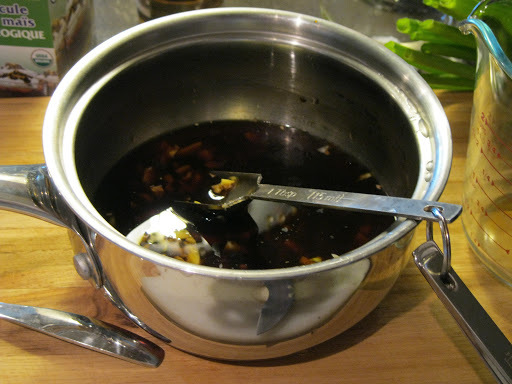 Heat until a deep-fry thermometer reads 350*F. Combine remaining soy sauce, cornstarch and sesame oil, plus reserved pork, the shrimp, water chestnuts, bean sprouts, scallions, eggs, salt, and pepper in a bowl. Using a ladle and working in batches, gently lower 1/2 cup amounts of egg mixture into oil; cook, flipping once, until omelettes are puffed and brown, 1.5-2 minutes. Using a slotted spoon, transfer omeletts to paper towels. 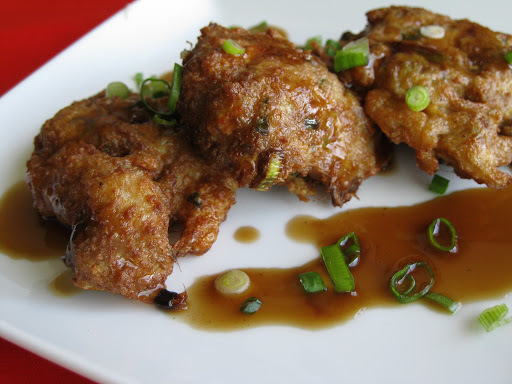 Serve drizzled with reserved sauce; garnish with scallions.